Informed, alert communities play a critical role in keeping our nation, state, and county safe. 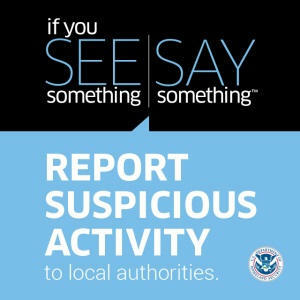 “If You See Something, Say Something”™” is a national effort to raise public awareness of the indicators of suspicious activity, as well as the importance of reporting it to local law enforcement. Residents and visitors are encouraged to be alert to their surroundings and report suspicious situations or behaviors. Every time you SEE something, you have an opportunity and the responsibility to SAY something to help keep your community safe. Unusual Items or Situations. A vehicle parked in an odd location, a package/luggage is unattended, a window/door open that is usually closed, or other out-of-the-ordinary situations. Inquiring Minds. A person who questions individuals at a level beyond curiosity about a building’s purpose, operations, security procedures and/or personnel, shift changes. etc. Observation/Surveillance. Someone who pays unusual attention to facilities or buildings beyond a casual or professional interest, loitering without explanation (especially in concealed locations), repeated or prolonged observation of buildings and people, taking notes or measurements. Calling local authorities is the best way to help. Your calls provide law enforcement with data to make decisions like when and where to deploy patrols. It also helps them identify trends. In addition, you can also help by spreading the word to those around you. Share these useful resources with your neighbors, coworkers, and friends.